Quick guide to change language in Windows 10 to English or any other language. Applicable to Windows 10 pro, home, lock screen, mobile, apps. Looking for a way to change language in Windows 10 Pro from languages you don’t know of like Arabic, Italian, German, Chinese or Japanese to English or to any other language? Here’s how. Before we begin, I would like to let you know that there isn’t a one off option to change everything to the language you desire. 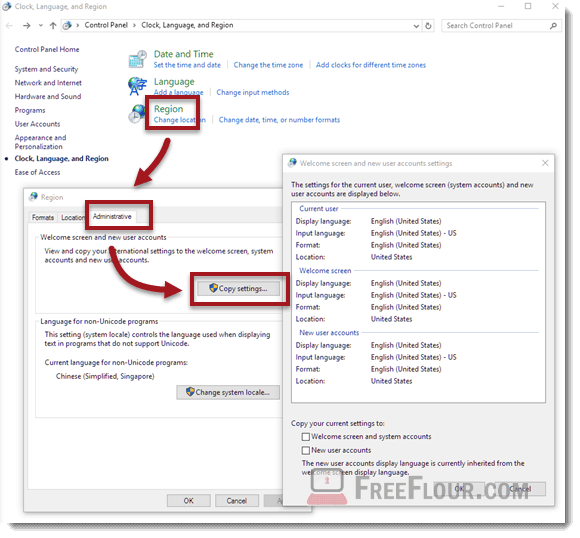 There are multiple sections and categories of which you can make changes to allow Windows 10 to display your desired language in certain parts of Windows depending on what outcome you are expecting. 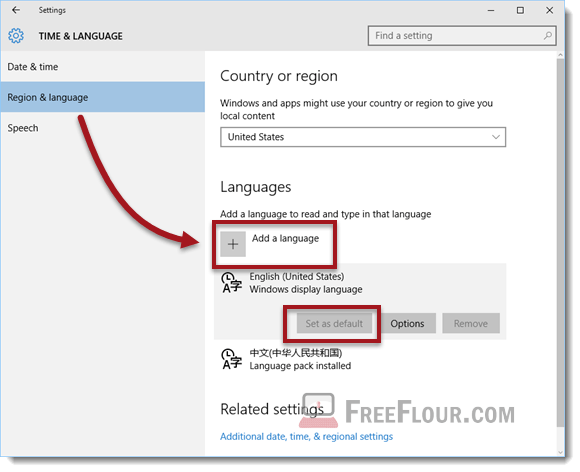 Generally, you would want to first add your desired language to the Windows 10 language preferences list. To open the list, go to the Windows Start button located at bottom left corner of your Windows screen. Click on Settings, then Time and Language. On the left panel, click on Region and Language. To add a language to read or type in that language, click on the + Add a language button. For example, in our case, we would add English to the list. To allow Windows 10 to display the main components in English, after added English to the list, click on it and select Set as default. Restart your PC computer and everything should be displayed in English now. If any program doesn’t display the texts correctly because they are in foreign language, you may want to add the language to the list in order for Windows to render and display the texts for the program. However, you don’t have to set this language as default. By adding the language to the list, any program appears in that language will be able to display the texts properly. You can add as many languages as you want to the list. The language being set as default will be the main language used for all components in Windows 10 such as your desktop screen, Cortana, Settings, Welcome Screens, File Explorers, etc. 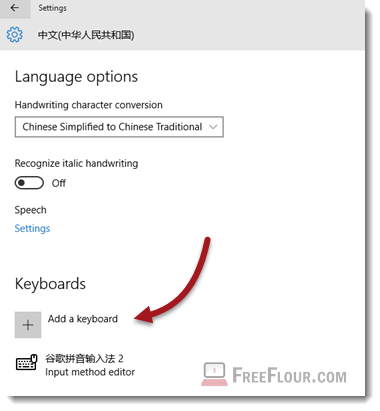 In the Windows 10 language preferences list, after you have added a new language, you can add an input method for the language by clicking on it and select Options. Under Keyboard, click on the Add a Keyboard button. Select your desired input method and press OK.
To configure settings of the input method, click on your newly added keyboard method, and click Options. This is especially important when you want to add a handwriting or speech method for a very specific language such as Chinese Pinyin, Japanese Katakana, Hiragana and Kanji, Arabics, Korean Hangul, etc. Though it has minimal to no effect to the language in Windows 10, it is still preferable to set it to your own country. It affects what being displayed in the news feed of Windows 10, Cortana responds, calendar and basically anything else that is country based. For example, setting it to United States will make Windows 10 to show news feed mainly from the US, allow Cortana to respond and provide answers based on your geographical location, Calendar to show holidays which only exist in your country, the default currency, time and date settings, the store, and others. In Windows 10, you can also change the display language, Input language, format and location for new user accounts, welcome screen and system accounts. Go to Settings, Time and Language, Region and Language, under Related settings, click on the Additional date, time and regional settings link. Click on Region, Administrative tab, and lastly the Copy Settings button. In this window, you can copy the language settings of your current user to the welcome screen and system accounts, new user accounts, or both. Additionally, in the Region window, you can adjust and make changes to all other elements such as data and time formats, currency settings, location etc.